Seamus Downey had a good game for Clare. 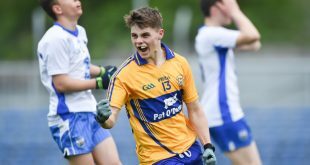 CLARE’S Munster and All-Ireland minor hurling dream for 2014 ended in Fraher Field, Dungarvan on Wednesday but not before they put in a truly courageous performance after a disastrous start. Nine points down after eight minutes, they looked to be on the road to a hiding. Reduced to 14 men five minutes into the second half, a heavy defeat looked the likely outcome but from here on, Clare dominated and were two points in front by the three-quarter stage. Clare almost snatched a sensational win in injury time but the winners’ goalie, Billy Nolan, produced a magnificent save, at the expense of a 65’, from David Fitzgerald, one of Clare’s better players on the evening. Clare continued to pile on the pressure but time was not on their side. In the end, Waterford had a bit too much experience and strength and emerged with a point to spare, to seal a place in the Munster final. Waterford went into the game showing five changes in personnel and wholesale positional switches from the side that struggled to a first round win over Clare in Ennis two months earlier. Following that defeat, Clare went into the losers’ group, where comfortable wins over both Kerry and Tipperary earned them a semi-final date with Waterford. Ben O’Gorman was named at wing-back for the first round tie in April but he was rushed to hospital on the night before that game to have his appendix removed. Fully recovered, he was back in the team for last night’s semi-final and lined out at wing-back. Interested spectators amongst the big attendance of 2,750 at Fraher Field were Limerick minor team coach, Jerry Wallis and Joe McKenna, who heads up the Shannonsiders development squad programme. Limerick play Cork in the second Munster semi-final this Thursday evening at Limerick. A blistering start saw Waterford take a nine-point lead after just eight minutes. They were the much sharper outfit and Clare can count themselves fortunate not to have been further behind at this early stage, as they struggled to match the home side throughout the field. Aaron Shanagher missed two easy scores before he eventually opened Clare’s account with a goal in the 11th minute, a score that Waterford goalie Billy Nolan will be disappointed with, as he had all the time in the world to save a rather easy shot from the Clare full-forward. Shanagher struck again three minutes later for a second goal, as the visitors came more into the game but they were still struggling to get scores. The next 10 minutes saw each side add one point and the score stood at 1-7 to 2-1 with five minutes to go to half-time. A minute before the end of the half, Waterford’s Shane Bennett won possession 60 metres from goal and he raced through to drill home his team’s second goal. Michael O’Malley replied with a Clare point to leave the half-time score at 2-8 to 2-2 in favour of the defending All-Ireland champions. Galvin put Clare in front for the first time. 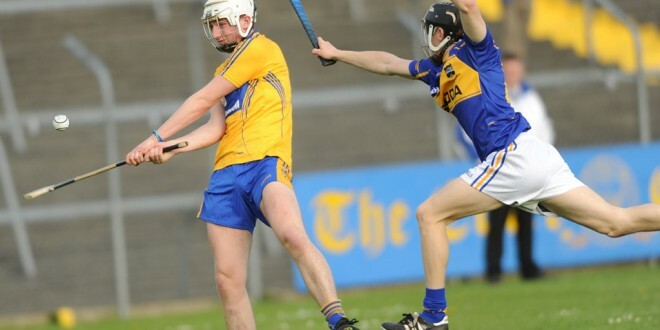 It was all Clare at this stage and they doubled their advantage when Aaron Shanagher pointed. The Wolfe Tones man had a chance to stretch his side’s lead to three points a minute into the final quarter but he decided to shoot for goal and his effort was saved. The home side had their first score of the half 17 minutes after the resumption of play through their top scorer, Patrick Curran and substitute Eddie Meaney levelled a minute later. It was end-to-end stuff from here to the finish, with the slicker Waterford outfit finishing in front, a result they just about deserved on the hour’s play. Seamus Downey, Jason McCarthy, David Fitzgerald and Dara Walsh worked hard throughout for Clare. Waterford: Billy Nolan; Eddie Hayden, MJ Sutton, Michael Cronin; Conor Prunty, Colm Roche, Jack Mullaney; Darragh Lyons, Andy Molumphy; Shane Bennett (1-2), Conor Gleeson (0-2), Cormac Curran; Peter Hogan, Aaron O’Sullivan (0-1), Patrick Curran (1-7). Subs: Shane Ryan for O’Sullivan (half-time); Eddie Meaney (0-1) for Hogan; Joe Allen for C Curran. 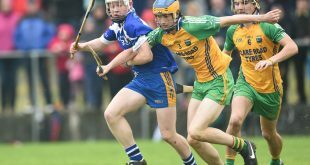 Clare: Jason Loughnane (Sixmilebridge); Ciaran Cooney (O’Callaghan’s Mills), Seamus Downey (Clonlara), Rory Hayes (Wolfe Tones); Jason McCarthy (Inagh-Kilnamona, 0-1), Dara Walsh (Éire Óg), Ben O’Gorman (Wolfe Tones); Michael O’Malley (Kilmaley, 0-1), David Fitzgerald (Inagh-Kilnamona, 0-1); Colin Corbett (Tulla, 0-4), Mikey O’Shea (Smith O’Brien’s), Ian Galvin (Clonlara, 0-1); Padraic McNamara (Kilmaley), Aaron Shanagher (Wolfe Tones, 2-2), Brian Guilfoyle (St Joseph’s, Doora-Barefield, 0-1). Subs: Gavin White (Sixmilebridge, 0-1) for O’Shea (28 minutes); Liam O’Donovan for McNamara (56 minutes); Darren Chaplin (Broadford) for Corbett (58 minutes).